Description: NS 14G with D9-40CW 9232 and Canadian National engines 2205 & 8817. Description: Slater's Road abandoned siding. Description: CN 2205 & CN 5757 Are in Charge of tonights 502. Description: Two locomotives head north to pick up intermodal freighter stuck in Mount Albert. On the right is new GO Transit train layover facility, in the very early stages of construction. Description: Finally on their way after a 3-hour delay. Description: A local crew takes train 31T up to the Hecks signals with a pair of CN units. Description: Closer view of the 31T at Hecks. Due to the CP strike in Canada, this train and 30T were routed over the CN to keep traffic flowing. Title: CN 2205, CN's Superior Sub. 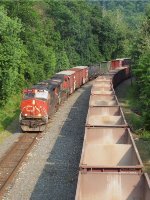 Description: Colorful freighter pounds the grade at Slater's Road siding. Description: 62Z pulls into the siding at west molly on the NS New Castle District to meet 2 north bounds before continuing on toward Muncie and points south. Description: NS 62Z with a trio of CN power heads up a Pot Ash train seen here speeding through Hartford City on the New Castle District. Description: Train M336 is headed south by Woodstock on Main 2 with Engineer Larry Moore and Conductor Buddy Gross. The crew has the front door cracked and the windows open due to not having AC on this hot summer day. Description: Inbound intermodal approaching McCowan Road crossing. Description: CN 2205 leads a manifest south through Pewaukee.